For booking, choose how many bikes you need. Two people can cycle, since it`s a tandem bike, and there`s room for one passenger. You can have two passengers if the children are under twelve years old. The maximum limit is ten bikes per booking. Please contact our email for group bookings. Welcome to Flekkefjordbanen and our railway biking trips. A perfect activity whether you`re are a family, a group of friends or for a teambuilding day with your colleagues . The bicycles are custom made and specially designed for comfortable and safe cycling on railway tracks. It`s a tandem bike with room for two people cycling as well as one passenger, as shown in the illustration above . The bikes are handy and flexible and can take wheelchairs and even children seats. The trip starts at Flekkefjord station. 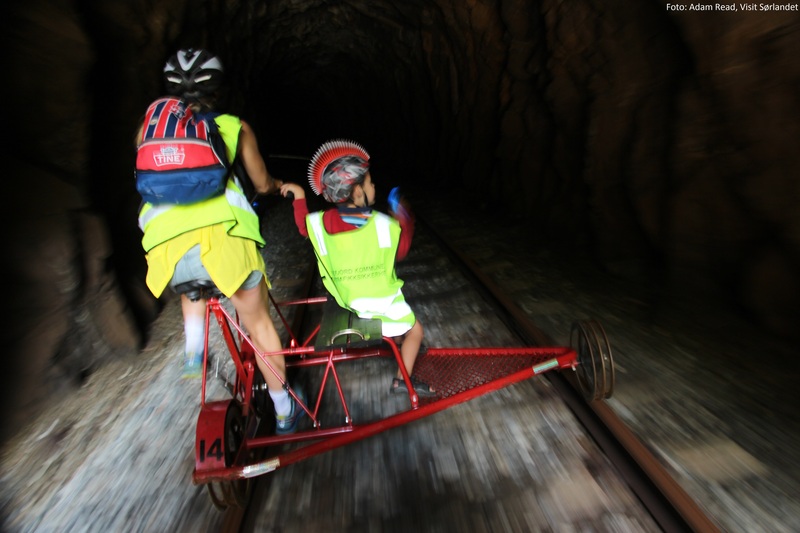 You will experience breathtaking sceneries and seventeen tunnels on your journey.